Nearly two hours into his set, Elton told a disappointed crowd of almost 11,000 that on police advice he had been told to stop playing. The Blackpool Tower Headland outdoor arena lies in the shadow of the Lancashire resort's tower. Rain poured for most of the day at the resort but relented as the concert began. The temporary stage though was buffeted with high winds shortly before Elton called time. "I have been told there is some really bad weather on the way," he said. "The police say you need to leave right now in an orderly fashion. I'm sorry but I don't want anyone to be hurt. I'll make it up to you." The largely middle-aged crowd filed away from their seats without much fuss and some were happy to buy programmes and T-shirts on their way out. Earlier he played a rousing set of all his hits and opened appropriately with Saturday Night's Alright (For Fighting). The concert was the first in a series of summer events at the venue but conditions were breezy throughout on The Promenade. 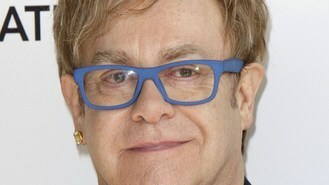 "I can't see anyone with a bikini on out there," Elton told the crowd on his first return to Blackpool since 1977. Other favourites played were Candle In The Wind, Rocket Man, Sacrifice and Sad Songs. Other planned events at the arena in the coming weeks include the visit of the Olympic flame and performances by The Wanted, McFly and John Barrowman. A celebrity switch-on concert for this year's Blackpool Illuminations will also take place at the end of August.